One of our fantastic Gig Buddy volunteers is in the midst of her degree dissertation, where she’s exploring her relationship to her Gig Buddy and their experience at a festival last summer. Gig Buddies helps people to realise that people with learning disabilities have a lot more options for how they spend their free time than just ‘learning disability nights’ (although we think these have a great purpose too). Every night can be a ‘learning disability night’ and we believe that disability equality means mainstream culture (and subcultures) accommodating disabled people and adapting so that everyone can be included. An example could be that staff in every venue give people the time they need to make a decision on a drink! Simple stuff really! Gig Buddies helps to make an equal society, not by claiming that everyone is the same but by saying that communities are better, stronger and happier if they include disabled people in every aspect of communities. 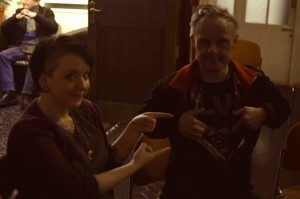 On a small scale, pairs of gig buddies demonstrate how possible this is, as one member of a community welcomes, includes and supports another member of the community who has a learning disability. Facilitating a relationship between a Gig Buddy participant and volunteer is a careful balance, ensuring that both parties are able to develop an equal friendship but that they are both able to access the support they need if and when they need it. However, unlike a lot of ‘service’ relationships, where the relationship is built on need and therefore the medical model idea of ‘what’s wrong’ with the person, with Gig Buddies the relationship is built on connection through passions, interests and activities. It starts with a positive outlook on disability, and with the idea that relationships are built on what’s brilliant about people. Although as a project we set out boundaries and assess risk to keep people safe, we see this as the scaffolding of the friendship, something to keep it going well, rather than being at the centre (music, music and more music) of the relationship between gig buddies. It’s also important that volunteers know how to support participants around their disability, but again, this is ‘scaffolding’ information, it’s not where the connection comes from! We don’t think that this makes the relationship unequal, because this means that the buddies can go out and enjoy each others company, and that any barriers that might get in the way of the participant going out are bulldozed! 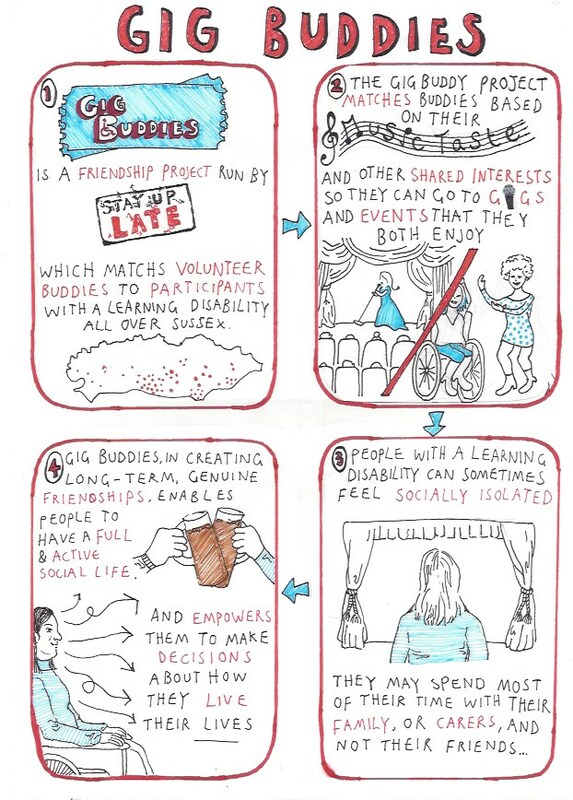 It amazes me how many volunteers don’t have any friends who have a learning disability before they become buddies (around 85%) so the gig buddy friendship is one of mutual growth and exploration. There’s a lot of emphasis on developing independence in social care, but maybe everyone (not just people with learning disabilities) needs to stop and think about developing their interdependence.